Preschoolers respond well to positive reinforcement within a learning environment, and our Free App of the Day utilizes that concept to keep players engaged. 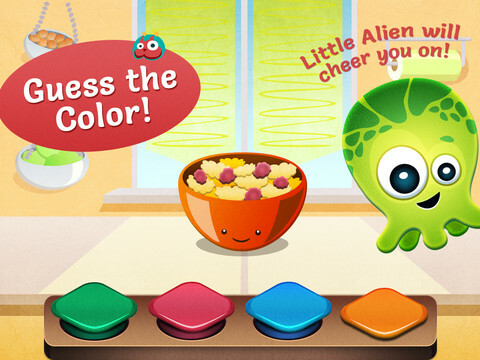 Little Alien features 5 recognizable “worlds” with 5 age appropriate mini-games in each and the star of the show (Little Alien himself) cheers on your kids at every step of the way. Little Alien is curious about the world, just like your preschooler! Let them play together and learn on the way. Join in the game yourself and see how your little one is learning. Made for preschool children, Little Alien does not have any countdown, scores track or losing lives. It plays out in a loop and there are no accidental in-app purchases. We know that children like to tap all over the screen, that’s why we made all the backgrounds interactive and fun. Every tap is a new discovery! The easy-on-the-ears music keeps rhythm in the game, but can be turned off, just like the game sounds. It is all about gently cheering on while learning and having fun! We at Space Squirrel care about and protect your privacy and the privacy of your child. – Does not gather nor share your personal information.